If your dog's photo needs updating or is missing please contact me. To view any dog's photos and information, click on the link. just call me. Christine Ward-Weber "Chris"
Breeding Quality Brittanys for over four decades! Bringing you long term knowledge about the breed. Our first litter included our first major title holder, Dual Champion Cimmarons Chevis Regal, UD. 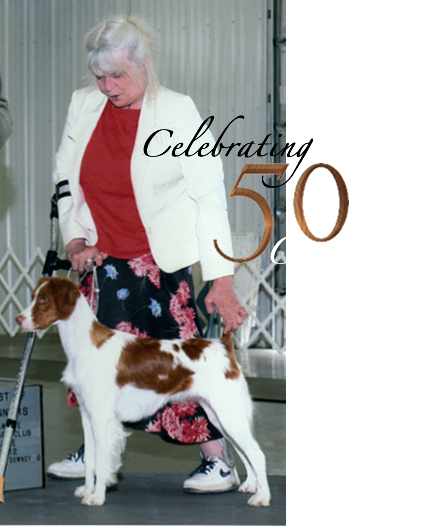 "Chevis" earned his Field Championship in Gun Dog stakes and his show title in the breed ring in addition to completing a Companion Dog obedience title, followed by a Companion Dog Excellent title. He retired from competition at 11 years, 11 months by completing his Utility obedience title in 1989 and becoming the first DC, UD Brittany male in the history of the breed at the time! The only other Brittany to accomplish this combination of titles was a female Brittany, DC Sequanis Triple Crown Sandy, who achieved it a few years before Chevis. No other Brittany has done this until recently. These two dogs demonstrate that the versatility of the Brittanys accomplishments may be limited only by the owners imagination. Cimmaron Brittanys record speaks for itself: all of the dogs listed on our site were bred by Christine Ward-Weber, none of the dogs listed are dog simply sired by our stud dog, or include grand dam credits....Our name is on each one of these dogs as a listed breeder, and were born and whelped on our property except for 1 litter co-bred with John Marsman of Marsport Brittanys. Our winning competition record includes: 86 individually titled dogs, many with multiple titles, in multiple venues, within AKC, BHU, Shoot to Retrieve, Working Dog Club of America, Nadac and more. • 1 National Specialty BOB • 4 Dual Champions • 1 AKC AFC • 1 National AFC Champion RU • 59 + Show Champions • 40 + Obedience titles • 10 Agility winners • 2 Tracking Dogs • 5 MACH Brittanys • 13 with Hunting test titles • 1 AFC - BHU • 2 Shoot to Retrieve Winners • 7 ABC *(ROM's) • Only AKC GOLD Breeder of Merit as of 1/19 for Brittanys! Additionally Cimmaron Brittanys have competed in non-American Kennel Club competitions, earning a Working Dog Endurance Certificate, and UKC and NADAC titles! Now with 60 OFA bred dogs to our credit! (owned by Hank & Dee Hartnek). Note: Dogs from the past will need more titled get (offspring) as the titles being offered by AKC has increased thru the years. Not to be slighted is our large family of pet and hunting dogs in great homes. We are so thankful to our great owners who in many cases are now returning for additional and new companions. Thank you all. Our Brittanys have been competitive now for over three decades, let us know if we can bring a quality Brittany into your home. Cimmaron Brittanys objective is to breed healthy, loving Brittanys for personal hunting dogs, competition dogs and companions. 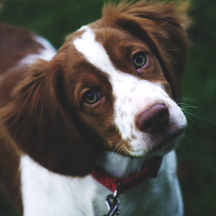 Cimmaron believes in the versatility of this breed and are convinced that all areas of competition are valid for the Brittany, from obedience to agility, from hunting to companionship, to Best in Show, to National Field Champion, a Brittany CAN do it all!. All of our Brittanys are guaranteed to have the natural instincts needed to hunt. Our show/breeding stock is guaranteed to meet breed standards. 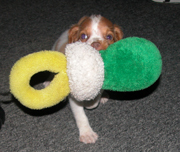 All of our puppies are guaranteed for hips, general health and temperament. All of our guarantees are in writing. A Cimmaron Brittany can rise to the task.